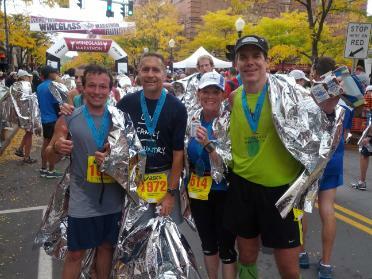 Pacer Pete celebrates with his 4:00 Marathoners at the Wineglass Marathon. No music for me – I’m old school. I play the songs in my head or sing ‘em out loud. Follow politics & wash dc govt. religiously. Golf & cooking. NCR Trail Snails. Don’t let the name fool ya – these maniacs run turned me on to ultra marathons. The New York Times & The Washington Post. No books right now. Being a mid-back of the packer, qualify for Boston. Get my golf handicap down in the single digits. The social aspect, a great stress relief & I get to eat all the pizza I could ever want in addition to chocolate milk. Running makes me feel like a kid again. Probably my first marathon, Baltimore. The entire day felt magical, nothing seemed to go wrong, the miles ran by so quickly and my mom & dad were there to celebrate. I pace to give back to the running community, to help other runners achieve their goals and basically to have fun. Cleveland 2006. Horrible weather: rain, sleet, winds over 20mph. The group was down to one runner, Karol. She joined the group at m14, told me of her wishes to qualify for Boston but didn’t think it could happen because of the weather. I told her to run behind me when the wind picked up, draft, anything to steal time & conserve energy. We maintained pace and at M25 I told Karol to “go” she wanted no part of it and we crossed at 4:14:52 together holding hands. She made it to Boston! We are a rolling party! Actually, you’ll spend less energy than if you were by yourself, the miles roll by, before you know it we’re at M25. No banking time either – even splits the entire way makes it easier. Don’t go out too fast, try and stay with the group if you really want to run that particular time. Introduce yourself to at least two people in the group – make some new friends. Meet me after the finish for a beer.